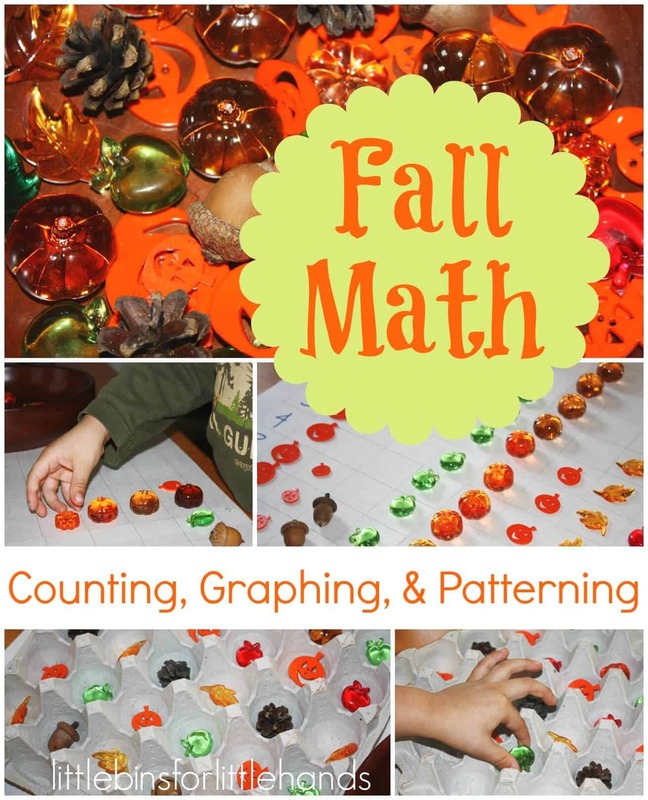 I thought I would use all these great fall themed counters for working on simple graphing and patterning early learning activities. Liam is great at counting one to one and understands a simple AB pattern. We haven’t played around much with patterning since he hasn’t been really interested in it when I have tried in the past. We also have never done any sort of graphing! I drew my own large graph on two sheets of paper. Of course, I counted wrong but we made do! I numbered it 1-10 and then found 10 unique objects and selected a specific amount for each one. I put them all in a bowl for him to look through. ( I only created enough rows for nine objects when I needed ten rows to make it work. We just stuck the remaining green leaf on the end. Oops!) We will be saving this graph for future use. You could leave the numbers off and have your child put the numbers in each time for extra practice. I will make numbered counters he can use. This would be great laminated too! Although it is pretty big. I explained what graphs are, how we use graphs, and why we use graphs. Mostly I emphasized that graphs can help show us how many of each item we have compared to how many we have of the other items. We can find out which item has the most and which has the least! I gave him the choice of doing all of each item first or choosing which ever item he wanted. He usually likes to finish all of one of something rather than going out-of-order! When we were finished, he could see which had the most and which had the least. I chose a large egg carton we had from the wholesale food store (5 dozen eggs). You could also use the graph you just drew but I also didn’t want to confuse the two. Also you could use small egg cartons or just the table! I started the AB pattern in each row for him and with the number of spots he could repeat the pattern twice. As he gets a little stronger with the concept, I have another container I can place next to this one to make it longer or more complicated. I simply used the objects in the bowl from the activity above. I had to explain to him a few times how to do it but he did a few rows with ease. The last row, I showed him how he could go through and correct it himself. These were two simple to create and fun to do early learning activities that were a little different from what we had been doing lately. 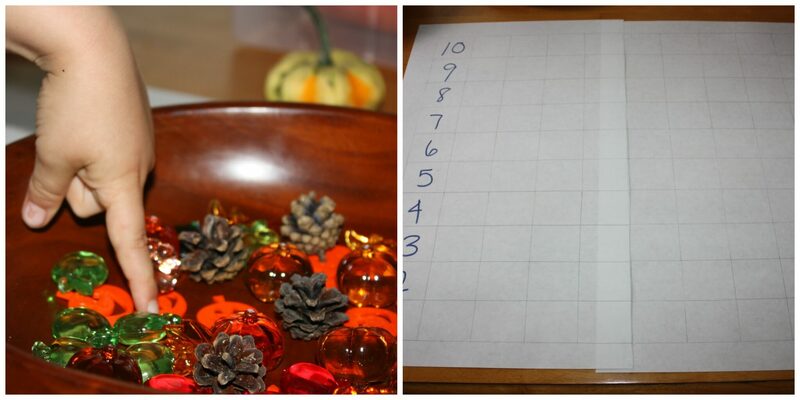 I love using themed counters and objects to bring graphing and patterning to life. It becomes a very hands-on and tactile experience for him since he is so sensory driven. I love the egg carton for patterning! It really helps kids visually see the pattern, I bet. I’ll be trying that for patterns. Thanks for sharing. This is a great idea and I love that you used a graph! You have some fun ideas here! Thank you for sharing! I found your post at Bee Crafty Kids.